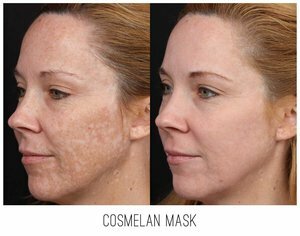 Cosmelan is suitable for all skin phototypes, including darker skin typically unsuitable for pigmentation removal treatments. This method can be initiated at any time of the year, including summer provided the client uses sun protection daily. Results are visible within the first or second week after the treatment. Pigmentation treated will start to fade and the skin will begin to look much brighter and rejuvenated. Cosmelan is a two phase treatment. After your initial skin consultation with on of our experienced therapists to determine whether you’re a suitable candidate for Cosmelan you’re then rebooked for your Cosmelan 1 application on another day. After a thourough cleanse and degrease Cosmelan is applied. It's a thick paste-like mask that is then left on the skin for anywhere between 6-12 hours (timing dependant on individual skin phototype) and is then removed at home. Phase 2 of Cosmelan involves the application of Cosmelan 2 maintenance cream at home - the application frequency will be determined by your therapist. This is what continues to inhibit melanin production over time to complete the treatment. To ensure compatibility of products and results every client undergoing Cosmelan, specific Mesoestetic products are mandatory post treatment with nothing else to be used on the skin until your therapist advises when you can resume other skincare. Included in the cost of Cosmelan Depigmentation is the Cosmelan pack which contains: Cosmelan 1 (in clinic treatment), Cosmelan 2 maintenance cream (homecare) and Hydra-Vital Factor K cream (homecare). You will also receive: Hydra Milk Cleanser, Hydratonic Toner, Fast Skin Repair, Hydra-Vital Face Mask and an SPF 30+. $1,349 - Initial $99 fee from initial Visia Skin Consultation will be deducted from treatment cost.